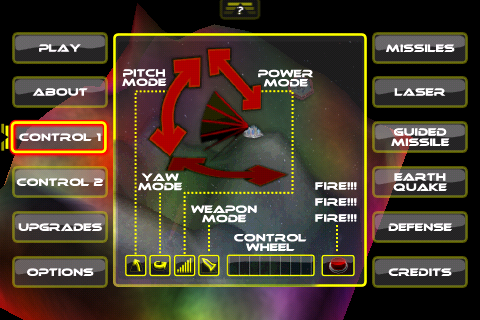 Added wind effects (no wind in low difficulty, moderate wind in medium difficulty, strong wind in high difficulty) and drag to missile shots (not guided missile or laser). Wind also affects pod city when falling/jumping. 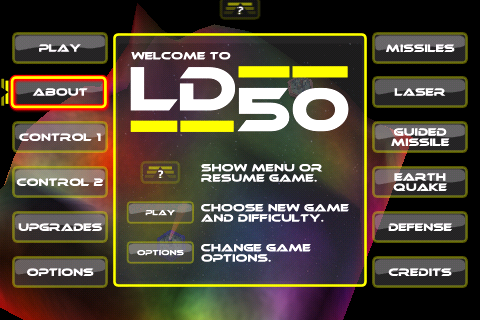 First time players will see LD50 splash screen. Added practice mode so that players can try out different weapons without having to wait for AI to take turn. Updated intro help page to be more useful. Removed superfluous help pages. Added/changed help pages for controls. 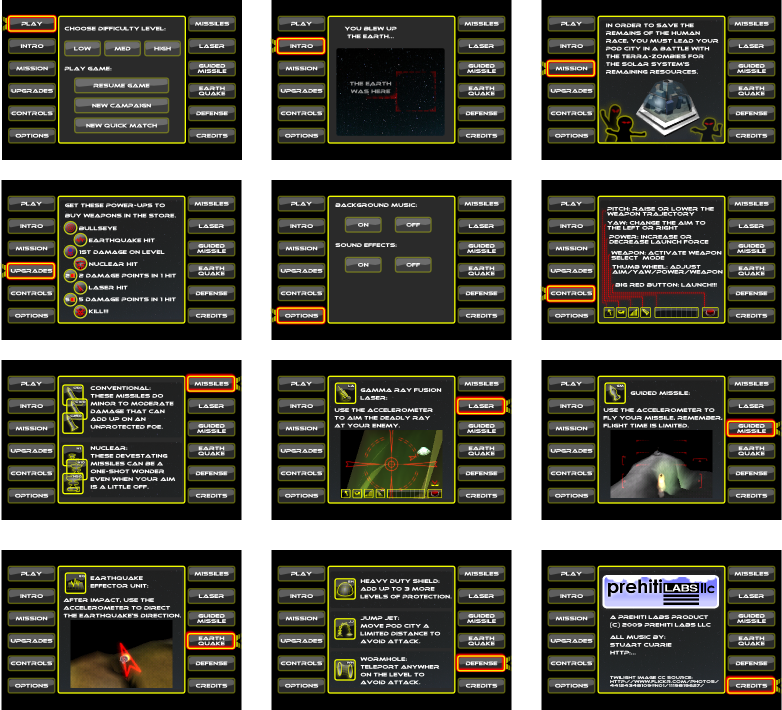 Now included visual instructions on how to use the interface and how to manipulate the view. Added context help to mode buttons in low difficulty level. Clicking on the current mode button a second time will show help for that button. Changed the way laser does damage. The amount of damage is now reduced every time the ray goes through the terrain. 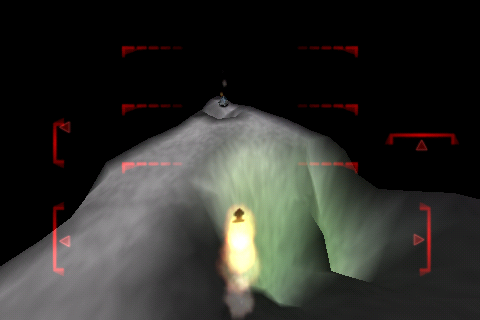 When a player uses the jump jet to land on another player, the jumper will die and possibly do damage to the jumpee due to the resulting explosion. 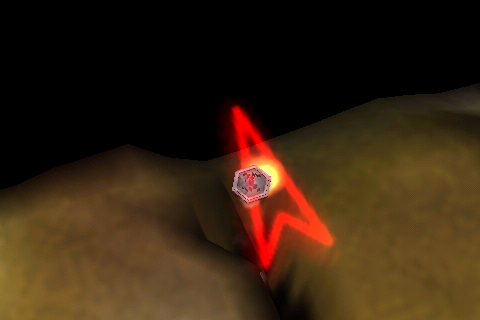 Added skybox with subtle star pattern. Added timeout to pod movement in cases where velocity does not stabilize. This occurred most often when a player fell into a valley created by the earthquake bomb. Also changed the friction of terrain to be a bit lower. 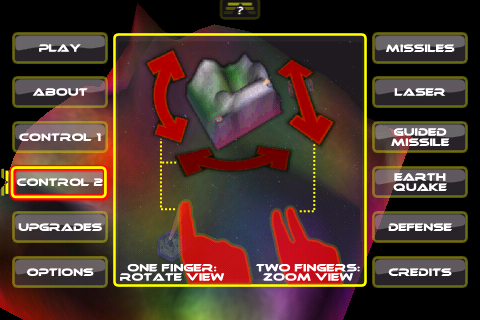 Changed view manipulation: Low difficulty level can rotate the view freely. Medium and high difficulty levels are still constrained, but the movement is now based on spherical rotation rather than constrained to a plane. Zoom is now possible with two-finger input. If the game crashes, game progress will be erased to avoid any recurring problems. 2 songs now alternate during gameplay. Fixed crash when using jump jet. Fixed crash when starting store. Fixed restore issue after kill. Fixed bug where player can get stuck in the air after a powerful jump jet. Fixed issue where control wheel drag would not work correctly. Fixed problem with AI where best shot was not always used. Fixed problem with AI where simulation of shot didn't match AI probing of shots causing AI to always miss. Fixed restore problem where items bought in the store were missing on resume. 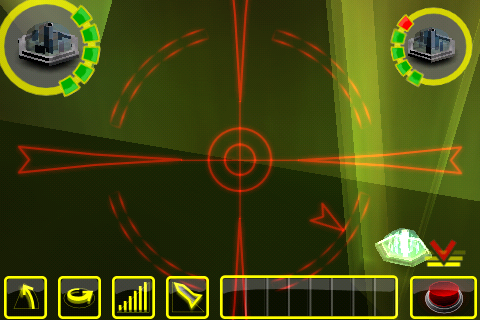 Fixed bugs where bounds of level were not correctly calculated. This caused players to often end up on the fringe of the level or shots to erroneously miss. Fixed jump jet launch splash appearing in wrong place. Fixed bug where AI did not reset aim after player does jump jet or wormhole. The skybox has been temporarily removed due to a performance issue. I'll be reviwing this and I will likely re-introduce the skybox for the final version. Ater some wrestling with a few tough bugs, it's time for the first wave of the beta test. 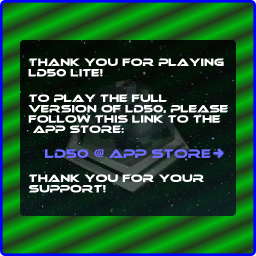 I've decided to throw LD50 up on ibetatest.com. I'm interested to see how it goes... they've put together all of the requisite stuff to have a good relationship with testers. Please hop on over there and sign up if you'd like to test LD50. For those folks that were part of the alpha testing, I'll carry your UDID's forward into the beta, so no need to sign up. Just packaged up the last alpha release. There are just a few things missing, including modifying difficulty level and save/restore of game state. I'll also be doing a tuning pass to speed up load time and get a few additional fps. I might even check for memory leaks. 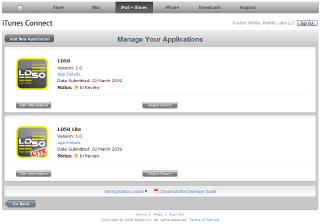 It's good to see an ecosystem forming up around the iPhone... today's notable addition: http://ibetatest.com/ These guys are bringing developers and testers together in a way I'm sure Apple was hoping to see. It's been a busy week or two, except for a trip to the snow in Tahoe. The latest work is on the menu/help system. Below is a contact sheet for the new menus. 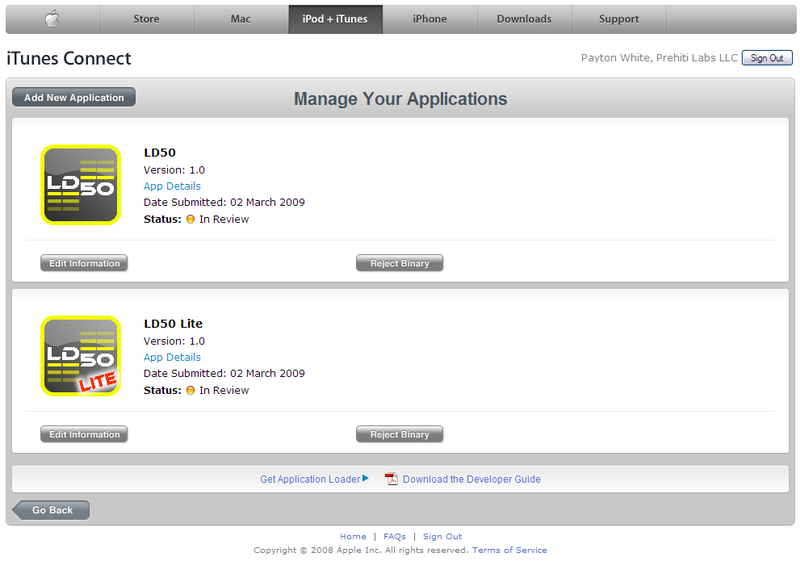 These will be activated in the next day or so. After this, the remaining work is largely under-the-hood tweaking and tuning. New ad hoc version today with a super-simple gameplay upgrade. 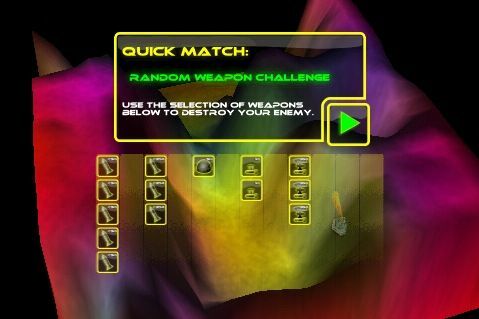 Now, each round starts by giving the user and the computer an identical set of random weapons. Of course this isn't the final gameplay mechanic. An upcoming rev will add a "career" mode with an upgrade store between rounds. Here are some snaps of the latest LD50 development. Highlights are the three weapons now controlled by the accelerometer: the guided missile, the laser and the earthquake bomb. So, with three accelerometer controlled weapons, there's a new, more interesting balance to the game. The weapons that would otherwise be somewhere between the small conventional weapons and the catastrophically cool nukes are not without their charms now. 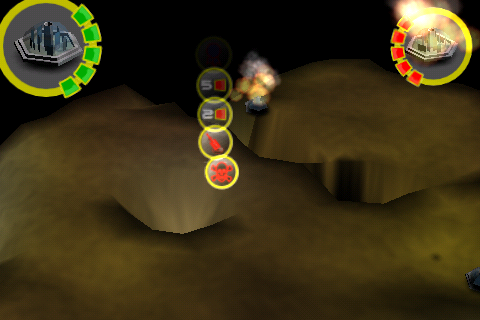 The earthquake bomb, for instance (maybe to be anointed the "earthquake affector") occasionally does a little damage and can be used strategically to disadvantage an opponent. Now, with the interactive control, it's lethality is in the hands of the user. Way more incentive to pony up for it and the other weapons in the upgrade store between rounds. Also included is a shot of the power up bubbles floating away from a recent kill.